Adjust your mirrors, warm up your engines and prepare to have the time of your life in the 5 Reel Drive slots. Click here to play! You're in a race against the sun as you try to cross the USA from coast to coast in your car or big rig. You'll need to keep yourself fed and your wheels fuelled if you're going to beat the other racers across the country, and every knows what the best road food is. In the 5 Reel Drive slots, your racing abilities are powered by hamburgers, fries, pop, pie, and the ubiquitous breakfast of champions: coffee and a donut. While speeding along the highway, be sure to look out for Wild Turn symbols that'll find you shortcuts to fame and, more importantly, fortune. Also, watch for the cops, as if you can keep them on your side, they'll make it harder for the other racers and leave you to take the prize. 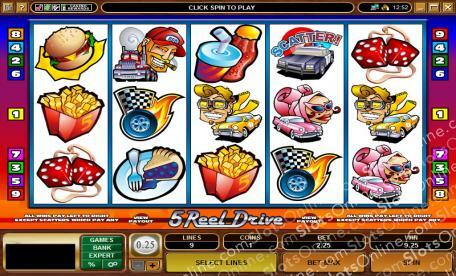 There's no time to waste if you want to win the 5 Reel Drive slots race! Hop in, get revved and burn across the road to riches. Police car symbols act as scatter symbols, paying out on total bets. 3 cars payout 5 times the total bet, 4 cars payout 20 times the total bet, and 5 cars payout 50 times the total bet. Wild Turn symbols substitute for any symbol other than scatter symbols. Autoplay can be set for up to 500 spins. It may also be set to stop when a jackpot is won, on any win, on a win of a certain amount, or if credits increase of decrease by a certain amount.